Cathy has worked as an accountant in both the for-profit and nonprofit sectors, including the International Association of Business Communicators and the Gymboree Corporation. Cathy was thrilled to join CompassPoint because its culture and commitment to helping organizations improve themselves align with her own values. 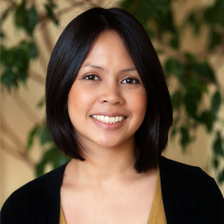 Born and raised in the Philippines, Cathy now lives in South San Francisco. She volunteers at her daughter’s school and is interested in learning more about nonprofits that work with people with disabilities. She loves to travel. She has visited Hawaii and Mexico, and hopes to someday add France and Italy to the list. She also enjoys playing volleyball and tennis.